I met Adelaide Ortega in April at the conclusion of the California Blind Golf Classic in Lompoc. She had parred the 17th hole and her emotions were soaring on the wings of eagles. Her drive carried a water hazard and skirted two sand traps to reach the green. 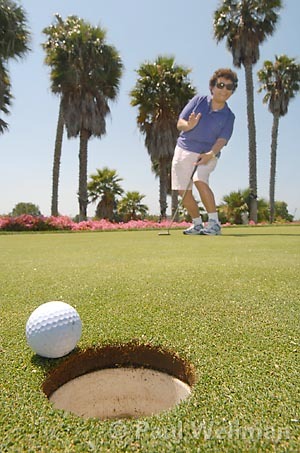 “My first par,” she grinned broadly, looking toward her coach, “he was so excited.” Playing golf while blind is a team sport. Major responsibilities rest on the golfer’s coach, the person with working eyes who scouts the landscape, advises on club selection, and aligns the golfer with the ball. Ortega’s coach is Chip Milne, 71, a retiree who shoots in the 80s at Muni. “I was more excited than she was because I saw it first,” Milne laughed. “She heard about it from me.” From 20 feet, Ortega two-putted for her par. It was her first in four years of competition at this tournament and a notable achievement in blind golf, in which pars are valued as highly as birdies among sighted golfers. Never having played, nor ever having been particularly athletic, she had to start with the basics and the blind golf credo-“the ball gets in the way of the club.” If her backswing and swing are consistent and she begins with her club at the ball, where her coach positions her, she will connect, at least theoretically. “When you hit that sweet spot, it sounds beautiful-as good as when the ball falls into the hole. I love that sound-plunk.” She plays weekly with a group from the Braille Institute. After 10 years, she is still improving. “I actually can hit the ball a lot more often,” she laughs. Golf is a walk in the park. Her approach to the sport is less than intense. She savors the outdoors, listening to the birds with the sun and wind in her face. It reminds her of her childhood when she read her surroundings to find her way back from Red Rock to Paradise. Many blind people lose their sight gradually through degenerative diseases. For Ortega, it vanished virtually overnight. “I woke up one morning with double vision. The doctors didn’t believe it. It mostly happens in the Midwest or to people who have traveled out of the country,” she recited without emotion. The culprit was truly obscure-ocular histoplasmosis syndrome, which develops in rare cases in the aftermath of a fungal infection. Within a year, 1984, her vision was gone in her left eye and reduced to light and dark sensations in her right. But in 1984, folk wisdom was not enough for his blind and depressed daughter. Finally, her family sought professional help. “They took me to Braille Institute and left me, just left me. The Braille Institute saved my life,” she said with conviction. There Ortega met other blind people and discovered they told stories like hers. She learned day-to-day survival skills, and baskets. 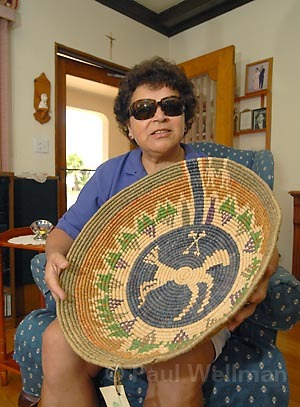 Her baskets tell her story, her life richer now than her life with sight. The richness seems linked in some invisible way to her father. In each basket, each figure is precise with crisp lines demarcating one color from another. As she tells each story, she traces the colors and figures with her fingernail, as if she could see them. “Wait a minute,” I think. “Are you really blind?” I grasp for words. “How do you do that?” I ask. “The colors feel different,” she replies. I run my own fingertips across the stitches. They can feel no lines, no ridges, no patterns, no differences whatsoever. Whatever it is, it is beyond tactile. Ortega’s life is full. She is president of the Santa Barbara Chapter of the National Federation of the Blind. At the Braille Institute she teaches basket weaving and ceramics. She does frequent speaking engagements. 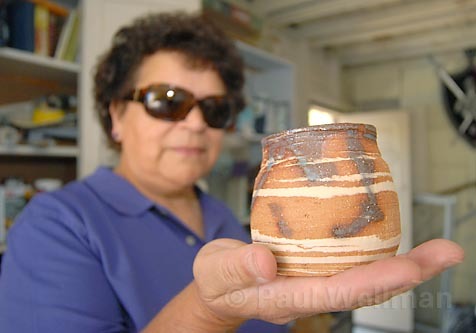 At La Casa de la Raza she has taught ceramics to youth for nearly a year. Ranging in age from elementary to high school there are about a dozen students, mostly girls. “Since I’ve lost my eyesight, I have met the most interesting people. I’ve met doctors, lawyers, school principals, woodworkers, the kids. I never would have taken the time to meet them. None of the things that have happened to me would have happened if I had not lost my eyesight,” Ortega said.